The default in Argentina, as with everything, has two-sides to each crisis. 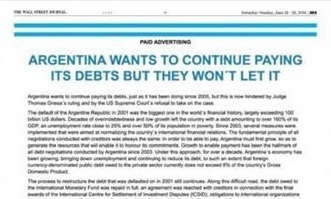 Argentina has been placing advertisements in the US Wall Street Journal and overseas in the leading newspapers of Europe with the headline – “ARGENTINA WANTS TO CONTINUE PAYING ITS DEBTS BUT THEY WON’T LET IT”. This brings up an interesting question with the conflict between a market economy and a closed economy. On the one hand, Argentina and most governments can sell their debt because it is a market economy meaning the debt can be resold and is in the form of bearer bonds – whoever possesses the bond gets paid. The clash comes when the original buyer sells the bond to someone else at a discount because they just want out (market economy) and the buyer then takes the risk of getting repaid. This is part of the liquidity of markets – the capacity to buy and sell in street name. On the one hand, the original investor was willing to settle for less, but the buyer wants 100%. Britain sold student loans for pennies on the pound. They did not give the students the right to pay off those loans at the same rate they sold the loans. There too, the students should have been allowed to pay off their loans at that reduced price. There is a point to what Argentina has to say, but on the other hand that would defeat a market economy. It seems that there should be a RIGHT OF FIRST REFUSAL, or in other words, the debtor should be allowed to pay off the debt at whatever the price the holder is willing to take. Hence, Argentina should have had the opportunity to buy in their debt at the reduced value just as the students should have been allowed to pay off their debt if the government was willing to sell it for 25% of what was owed. There does seems to be an argue for splitting the baby in half.